Staff members with the McHenry Library and the campus energy office developed a demand-based lighting system in the book stacks. 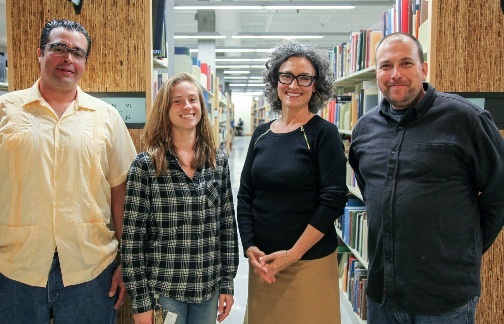 From left, Physical Plant Lighting Shop Technician Rudy Martinez, Energy Analyst Sarah Gilchrist, University Librarian Elizabeth Cowell, and library Head of Operations Marcus Thayer. Research, education, and operational improvements earned UC Santa Cruz three awards this year from the California Higher Education Sustainability Conference. The campus earned an award for its lighting retrofit and optimization in the McHenry Library; an award for its carbon neutrality roadmap; and an award for its sustainability minor and Sustainability Living Undergraduate Research Program (SLURP). The awards, now in their 12th year, recognize innovations at UC and the California State University that further campus energy efficiency and sustainable operations. The campus will receive the awards at the conference, held from June 27 to July 1 at CSU Fullerton. Staff members with the McHenry Library and the campus energy office developed a demand-based lighting system in the book stacks. The stacks tend to only be occupied for brief intervals, but were illuminated for long periods of the day. Sensors can now detect when a person is walking through the stacks and boost the amount of light. When no motion is detected, the lights dim down to a low level. Additionally, library lights were outfitted with LED bulbs, reducing the amount of electricity. Sarah Gilchrist and Chuck Dittrick from Physical Plant worked collaboratively with McHenry library staff, including Marcus Thayer, to make this project a success. The total project should save about 407 megawatt hours, translating to a 70 metric ton reduction in CO2. Just as UC President Janet Napolitano announced a systemwide initiative to be carbon-neutral by 2025, UC Santa Cruz was needing to updated its energy and climate action plans. To meet all this new goals, campus sustainability leaders decided to develop a comprehensive Climate and Energy Strategy. You’d be wrong to think it’s a stack of paper in a three-ring binder. Climate Action Manager Christina Thomure and Campus Energy Manager Patrick Testoni worked with consultants and more than 125 staff, faculty, and students to develop a roadmap to carbon neutrality that’s backed by a dynamic computer program that can alter recommendations based on changes in energy market conditions, campus planning, and improvements in best practices. “This project exemplifies the collaboration and planning needed to realize UC’s carbon neutrality goals,” Testoni said. “It also serves as a leading example of how sustainability goals are fiscally responsible, if integrated into short term and long term campus planning. The team working on the Climate and Energy Strategy identified 350 energy conservation measures in 50 buildings; 20 photovoltaic, solar thermal and fuel cell projects; 12 distinct system-level energy conservation measures; and an additional 700 potential energy conservation measures across other buildings. The roadmap suggests the campus look to install enough solar panels to generate about 3.7 megawatts of electricity, and exit cap and trade in 2021 and focus on biogas purchases. Recognizing that the rapidly-growing and linked ecological and social crises arising from stresses on supplies of energy, water, and food is among the most critical challenges for the next 50 years, College Eight at UC Santa Cruz launched an interdisciplinary minor in sustainability studies. The minor, established in 2014, is designed to be a complement to students’ majors, allowing them to broaden their applied skills and knowledge, and their ability to analyze and understand complex systems and their interactions through society and the environment. "Our goal in the minor is for students to develop the capability to analyze, understand and address ’wicked problems’—those whose causes arise at the intersection of social and natural forces, and whose solution requires integration across sectors, fields and disciplines,” said College Eight Provost Ronnie Lipschutz. As part of the minor, the college also supports the Sustainable Living Systems Undergraduate Research Program (SLURP). Projects include developing a tiny ‘ecotopia’ house in collaboration with Cabrillo College; an 18-month feasibility study of a phased conversion of campus shuttles and vanpools from gasoline and diesel to electric vehicles recharged by a campus solar PV system; and developing a sophisticated, interactive, neighborhood scale microgrid.